Have you herd the news? Your favourite sub-zero heroes are coming at you in this Christmas adventure - now in 3D. When Sid accidentally destroys Manny's heirloom Christmas rock and ends up on Santa's "naughty list," he leads a hilarious quest to the North Pole to make things right - and ends up making things much worse. Now it's up to Manny and his prehistoric posse to band together and save Christmas for the entire world!.. Have you herd the news? Your favourite sub-zero heroes are back in an all-new Christmas adventure for the whole family! When Sid accidentally destroys Manny's heirloom Christmas rock and ends up on Santa's "naughty list", he leads a hilarious quest to the North Pole to make things right - and ends up making things much worse. Now it's up to Manny and his prehistoric posse to band together and save Christmas for the entire world! Specia.. Gather your herd and get ready to laugh out loud watching the greatest animated “chillogy” of all time! Now you can enjoy all 5 hilarious Ice Age films in one supercool DVD collection. Meet Manny, Sid, Diego and Scrat in the original global hit comedy that started it all. Then follow the action-packed adventures of your favourite sub-zero heroes as they work together to thrive and survive in their prehistoric world, encountering wondrou..
Own Ice Age - The Great Eggscapade DVD from Deff, DVD, Blu-Ray & 4K Video Specialists - Free UK Delivery..
Ice Age: Join the coolest and most outrageously funny animated creatures of all time as they undertake an exciting, outlandish adventure! When they head south to avoid a bad case of global frostbite, a group of migrating misfit creatures embarks on a hilarious quest to reunite a human baby with his tribe. Featuring an all-star voice cast, including Ray Romano, John Leguizamo and Denis Leary, Ice Age is a "pure delight" (New York Daily N..
ICE AGE: Get ready for the coolest animated adventure of all time! Heading south to avoid a bad case of frostbite, a group of migrating misfit creatures embarks on a hilarious quest to reunite a human baby with his herd. ICE AGE 2: Trying to escape the valley to avoid a flood of trouble, Manny, Sid, Diego and Scrat embark on a fun filled journey across the thawing landscape and meet Ellie, a female wooly mammoth who melts Manny's heart..
ICE AGE: Get ready for the coolest animated adventure of all time! Heading south to avoid a bad case of frostbite, a group of migrating misfit creatures embarks on a hilarious quest to reunite a human baby with his herd. ICE AGE 2: Trying to escape the valley to avoid a flood of trouble, Manny, Sid, Diego and Scrat embark on a fun filled journey across the thawing landscape and meet Ellie, a female woolly mammoth who melts Manny's hear.. The laughs are twice as nice with Ice Age and Ice Age 2: The Meltdown - together on Blu-Ray for the first time ever! Ice Age: Get ready for the coolest animated adventure of all time! Heading south to avoid a bad case of frostbite, a group of migrating misfit creatures embark on a hilarious quest to reunite a human baby with his tribe. Ice Age 2 The Meltdown: Trying to escape the valley to avoid a flood of trouble, Manny, Sid, Diego a..
Ice Age: Twenty thousand years ago, at the dawn of the Ice Age, three completely mismatched creatures have been brought together by a twist of fate. 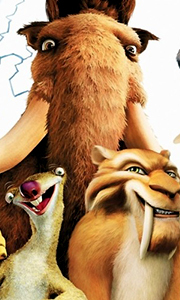 Sid, a fast-talking and comical sloth, Manny, a moody woolly mammoth, and Diego, a sinister saber-toothed tiger reluctantly team up to help return a baby to his father.Before their incredible journey ends, this unlikely trio will confront boiling lava pits, escape treacherous ice tunnels an.. The action heats up - and so does the temperature - for Manny, Sid, Diego and Scrat. Trying to escape the valley to avoid a flood of trouble, the comical creatures embark on a hilarious journey across the thawing landscape and meet Ellie, a female woolly mammoth who melts Manny's heart. Special Features Audio Commentary By Director Carlos Saldanha, Audio Commentary By Producer Lori Forte And Production Team, Artist Gallery Channel, Scr.. Your favourite sub-zero heroes are back for another incredible adventure in the super-cool sequel to the global hit comedy Ice Age! The action heats up - and so does the temperature - for Manny, Sid, Diego and Scrat. Trying to escape the valley to avoid a flood of trouble, the comical creatures embark on a hilarious journey across the thawing landscape and meet Ellie, a female woolly mammoth who melts Manny's heart. With its dazzling an..
Just when you thought they couldn't get any cooler...your favourite prehistoric pals from Ice Age and Ice Age The Meltdown are back in an all-new, ginormous animated adventure for all. This time around, Manny and the herd discover a lost world of ferociously funny dinosaurs, including a cranky T-Rex who's got a score to settle with Sid. Meanwhile, Scrat goes nuts over the beautiful Scratte, but is she trying to win his heart - or steal .. In the coolest adventure yet, Manny and the herd discover a lost world of ferociously funny dinosaurs, including a cranky T. Rex who's got a score to settle with Sid! Meanwhile, Scrat goes nuts over the beautiful Scratte, but is she trying to win his heart - or steal his acorn? Special Features Walk The Dinosaur Music Video, Falling For Scratte, Buck: From Easel To Weasel, Buck's Survival Guide: Fun Fossilised Factoids, Epic Sneak Peak.. In the coolest adventure yet, Manny and the herd discover a lost world of ferociously funny dinosaurs,including A cranky T. rex who's got a score to settle with Sid! Meanwhile, Scrat goes nuts over the beautiful Scratte, but is she trying to win his heart - or steal his acorn? Special Features Walk The Dinosaur Music Video, Falling For Scratte, Buck: From Easel To Weasel, Buck's Survival Guide: Fun Fossilised Factoids..
Scrat's nutty pursuit of the cursed acorn, which he's been after since the dawn of time, has the world-changing consequences - a continental cataclysm that triggers the greatest adventure of all for Manny, Diego and Sid. In the wake of these upheavals, Sid reunites with his cantankerous Granny, and the herd encounters a ragtag menagerie of seafaring pirates determined to stop them from returning home. Special Features Ice Age: The Stor.. Your favourite Ice Age heroes are back and cooler than ever in this all-new animated adventure that's mammoth-sized fun for the whole family! Scrat's epic pursuit of the elusive acorn catapults him into the universe, where he accidentally triggers a series of cosmic events that threaten the Ice Age world. Now the entire herd - including Buck, Manny, Ellie, Sid and Diego - must work together on a hilarious journey, filled with nonstop ac..
Join the coolest and most outrageously funny animated creatures of all time as they undertake an exciting, outlandish adventure! When they head south to avoid a bad case of global frostbite, a group of migrating misfit creatures embarks on a hilarious quest to reunite a human baby with his tribe. Featuring an all-star voice cast, including Ray Romano, John Leguizamo and Denis Leary, Ice Age is a "pure delight" (New York Daily News) for .. Your favorite Ice Age heroes are back and cooler than ever in this all-new adventure! Scrat’s pursuit of the elusive acorn accidentally triggers cosmic events that threaten the Ice Age world. Now Buck, Manny, Ellie, Sid, Diego and the rest of the herd must work together on a hilarious journey filled with nonstop action and colorful new characters in order to survive the global Scrat-tastrophe!..